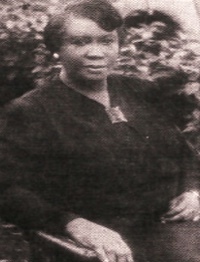 Catherine Brooks was an African-American Unity minister who was ordained in 1960. 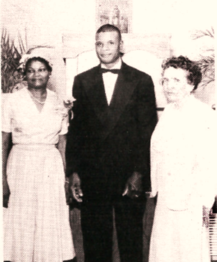 She and her husband James Brooks were part of a core study group led by Ms. Mamie Hughes in the 1940s. 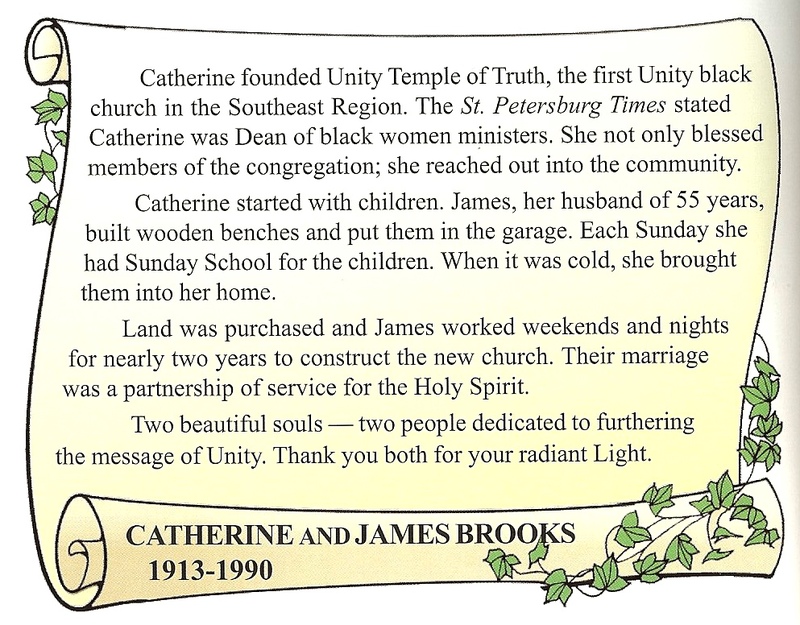 This eventually led to the founding of Unity Temple of Truth in St. Petersburg, Florida, the first Unity black church in the Southeast region. March 1956. Mamie Hughes’ health begins to fail; Catherine Brooks becomes the group’s new leader. July 1956. Ms. Hughes transitions and leaves a parcel of land at 511 Prescott St. in St. Petersburg. She designates this land to be the site for building a new church. While ministering to the study group, Ms. Brooks decides to begin her formal training at Unity Village and become an ordained Unity Minister. But since she is only to attend training during the summers and for six weeks a year, Mr. and Mrs. Brooks move closer to Unity Village. January 1957. Catherine Brooks launches a building campaign. James Brooks (Catherine’s husband), commences construction; he elicits part-time help from members of the study grou,p including Catherine, Vivian Lockhart, Leila Jackson. November 10, 1957. “Unity Temple of Truth Church” is officially registered and recognized as a member of the Association of Unity Churches with Catherine Brooks as its leader. Construction on the church is completed. 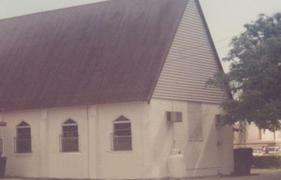 Catherine founded Unity Temple of Truth, the first Unity black church in the Southeast Region. 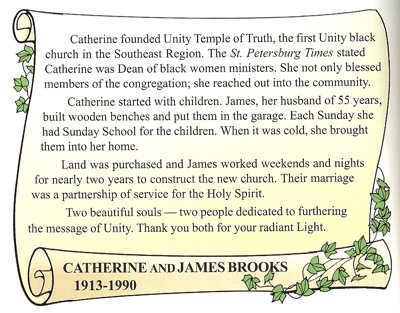 The St. Petersburg Times stated Catherine was Dean of black women ministers. She not only blessed members of the congregation; she reached out into the community. Catherine started with children. James, her husband of 55 years, built wooden benches and put them in the garage. Each Sunday she had Sunday School for the children. When it was cold, she brought them into her home. 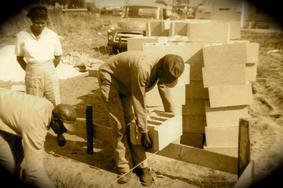 Land was purchased and James worked weekends and nights for nearly two years to construct the new church. Their marriage was a partnership of service for the Holy Spirit. Two beautiful souls—two people dedicated to furthering the message of Unity. Thank you both for your radiant Light. I invite anyone who is related to Rev. Catherine Brooks or who has any information about her to post a comment to this page or to contact me at mark@truthunity.net.